, an ingenious writer, was the son of a merchant of Montrose in Scotland, where he was born in October 1761; and after a good school education, was placed in the counting-house by his father, whose opinion was, that whatever course of life the young man might adopt, a system of mercantile arrangement would greatly facilitate his pursuits. It is probable that he went through the routine of counting-house business with due attention, especially under the guidance of his father; but his leisure hours were devoted to the cultivation of general literature with such assiduity, that at a very early age he was qualified to embrace any of the learned professions with every promise of arriving at distinction. His inclination appears to have led him at first to the study of medicine, and this brought him to London in 1787, where he entered himself at the Westminster Dispensary, as a pupil to Dr. Simmons, for whom he ever after expressed the highest esteem. At this time Mr. Christie possessed an uncommon fund of general knowledge, evidently accumulated in a long course of reading, and knew literary history as well as most veterans. While he never neglected his medical pursuits, and to all appearance had nothing else in view, his mind constantly ran on topics of classical, theological, and philosophical literature. He had carefully perused the best of the foreign literary journals, and could refer with ease to their contents; and he loved the society in which subjects of literary history and criticism were discussed. The writer of this article, somewhat his senior in years, and not wholly inattentive to such pursuits, had often occasion to be surprized at the extent of his acquirements. 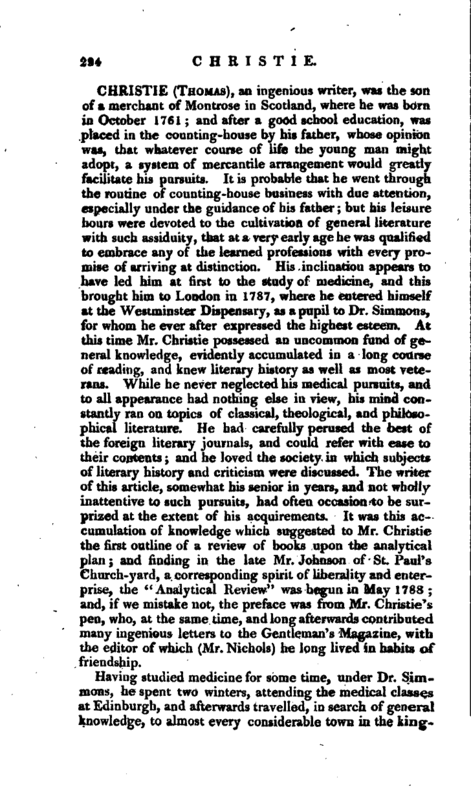 It was this accumulation of knowledge which suggested to Mr. Christie the first outline of a review of books upon the analytical plan; and finding in the late Mr. Johnson of St. Paul’s Church-yard, a corresponding spirit of liberality and enterprise, the “Analytical Review” was begun in May 1788; and, if we mistake not, the preface was from Mr. Christie’s pen, who, at the same time, and long afterwards contributed many ingenious letters to the Gentleman’s Magazine, with the editor of which (Mr. Nichols) he long lived in habits of friendship. 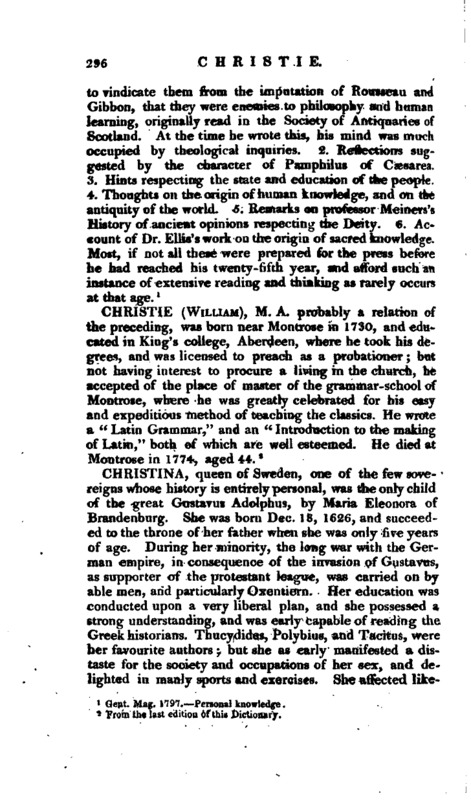 Having studied medicine for some time, under Dr. Simmons, he spent two winters, attending the medical classes at Edinburgh, and afterwards travelled, in search of general knowledge, to almost every considerable town in the | kingdom, where his letters of recommendation, his insatiable thirst for information, and above all, his pleasing manners, and interesting juvenile figure, procured him admission to all who were distinguished for science, and by many of the most eminent literary characters he was welcomed and encouraged as a young man of extraordinary talents. He then went to the continent for further improvement; and while he was at Paris, some advantageous offers from a mercantile house in London, induced him to resume his original pursuit, and to become a partner in that house. This journey to Paris, however, produced another effect, not quite so favourable to his future happiness. Becoming acquainted with many of the literati of France, and among them, with many of the founders of the French revolution, he espoused their principles, was an enthusiast in their cause, and seemed to devote more attention, more stretch of mind, to the study and support of the revolutionary measures adopted in that country, than was consistent with the sober pursuits of commerce. 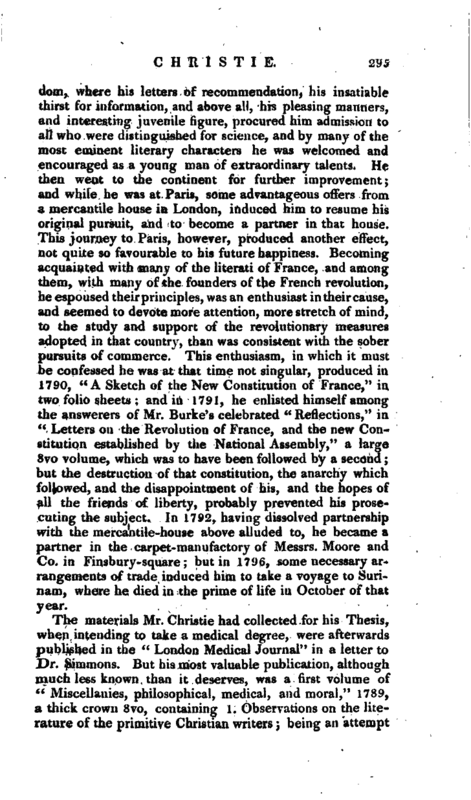 This enthusiasm, in which it must be confessed he was at that time not singular, produced in 1790, “A Sketch of the New Constitution of France,” in two folio sheets; and in 1791, he enlisted himself among the answerers of Mr. Burke’s celebrated “Reflections,” in “Letters on the Revolution of France, and the new Constitution established by the National Assembly,” a large 8vo volume, which was to have been followed by a second; but the destruction of that constitution, the anarchy which followed, and the disappointment of his, and the hopes of all the friends of liberty, probably prevented his prosecuting the subject. In 1792, having dissolved partnership with the mercantile-house above alluded to, he became a partner in the carpet-manufactory of Messrs. Moore and Co. in Finsbury- square but in 1796, some necessary arrangements of trade induced him to take a voyage to Surinam, where he died in the prime of life in October of that year.